Reinvented for 2013, the new Rally is your go-to kite for premium surf and freeride performance. This 4-line crossover kite has been completely reengineered and features new Connect Forward attachment points, Reflex Wingtip technology and a new bridle configuration all bundled into a surf tough construction with a reinforced trailing edge. The Rally produces unwavering rigidity and efficiency. 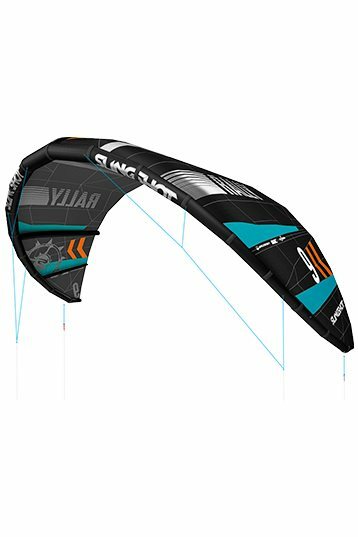 Flying further forward in the window for optimal upwind drive, this Open Delta-C kite will also sit back in the window when you want just the right amount of resistance for load-and-pop tricks or down-the-line pull. A kite in a class of its own, the 2013 Rally delivers maximum range, instant de-power, effortless relaunch and precise handling. Our integrated Splitstrut technology produces a rock solid canopy. The kite also comes with our patented One Pump technology and our improved Surf Tough Construction with improved trailing edge durability. This years Rally line up includes a 7-meter to help build your perfect quiver. You’re welcome! 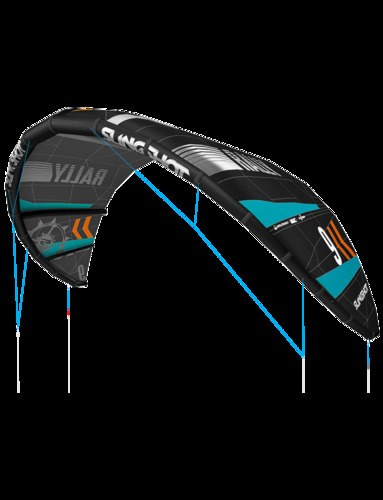 Rally is a premium surf and freeride performance kite. As you can see by its chacteristics, the Rally has become even more allround. We tested this kite in its low-end (10-14 knots) as well as in its high-end (17-22 knots) and you may have noticed a lot of high scores. In its low-end, the Rally did feel a little slower and heavier than in its high-end. Above around 16 knots, the Rally really starts to perform in its element. More lift, longer glide phase, quicker turns and faster reaction speed. The Rally rides easily upwind, probebly because its position seems to moved a little more towards the edge of the wind window. Because of its flying speed, the pop and lift of the Rally have improved significantly in its high-end. It is now the third season for the Rally and you can see it has evolved into a true allrounder. A kite for a wide audience of kiters, who will value its sheet & go characteristic. For wave purposes, The Rally as a wave kite is a little too slow for my taste (I like lively kites in the waves), although a 9m one will probably have a higher reaction speed and shorter turning circle (if you have a 9m Rally, you're welcome to provide your feedback!). Light old school riders will enjoy the 10m Rally, but I'd advise heavier ones (+/- 90 kg and above) to go for a larger size. All in all, the Slingshot Rally is a kite series that has been available since 2011 and has now been finetuned to a balanced sheet & go allround/old school kite, smaller sizes wave kite. What are your flying experiences with the Slingshot Rally? Good lowend for a delta kite. Relatively large FT, so sitting back in the wind window. Upwind performance is poor in the lower wind range. First of all, i'm not only a tester but also an owner of the Rally 2013. Riding sizes 8, 10 and 12. For me the Rally is a freeride kite. 2013 compared with the 2012 the 2013 has more lift and glide which is good for oldskool. The 2012 was a little bit faster, especially the bigger sizes. A stable kite with good depower. Good for advanced and beginning kiters. The rally is more for the freeriders, a little bit of everything. Great lift and pop. More bar pressure than the RPM and a longer gliding phase. If you want a great kite for starting to jump, this is the one. First impression on Slingshot Rally 10m. I tested the Rally for the last couple of years, and it changed a bit. It always was and still is a sheet & go kite. In the early series more aggressive with lot of pop and boost. Last years the Rally became more gentle and forgiving. This 10m Rally feels heavier, like a truck with depower. Solid but a little bit slower and more low-end than its former series. The 10m turned more around its tip than the center turned Rallys from 2012-2011. I know smaller series will react differently so if there are any riders experienced with the smaller Rallys I am curious about their turning speed. wave rides. Durable like always, Slingshot is about quality!